Swim-up bar, new water park with pirate`s ship, castle, nine water slides, lobby area, main restaurant is totally renovated. Breakfast, Lunch, and Dinner a La Carte, Available from 7:00 A.M. to 11:00 P.M. Amenities: Balcony with garden or pool view, two double beds, air-conditioning, cable color TV with remote control, iron and ironing board, coffee maker, safety-deposit box, telephone with direct dialing, radio-alarm clock, full bathroom with shower and bathtub, make-up mirror, and hairdryer. Amenities: Spacious beautifully appointed mountain view room with balcony, one king size bed, air-conditioning, cable color TV with remote control, safety deposit box, coffee maker, telephone, clock-radio, iron and ironing board, full bathroom with shower and bath tub, hairdryer, and shaving mirror. Additionally, this rooms offer and adjoining area with bunk beds, trundle bed, an additional TV and mini-fridge for children. Maximum Occupancy: Two adults and three children, or one adult and three children. Crown Paradise Club is located 0.5 minutes from the marina pier, 2 miles/4 kilometers from the Puerto Vallarta International Airport (PVR), and 2 miles/3 kilometers from downtown. You Will Find the Most Comprehensive All-Inclusive Vacation for the Entire Family. Free City Tour, Including a Tequila Distillery (one per Guest/per stay). 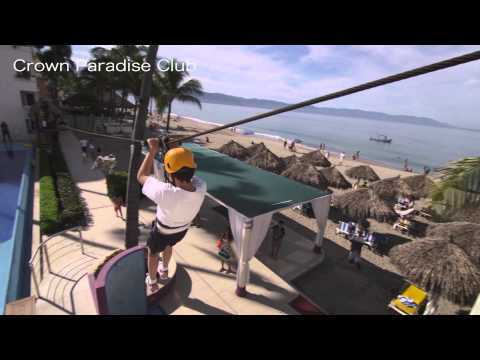 Rated Best Family Resort in Puerto Vallarta! Now - newly remodeled swim-up bar, new water park with pirate`s ship, castle, nine water slides, lobby area, main restaurant totally renovated. This resort features an in-water park, where the children are the VIP Guests! You will also find one buffet-style and three fine dining restaurants, five bars, and 24-hour room service. The Crown Paradise Club believes that when children are happy, everyone is happy. To that end, they have made a commitment to make little ones the #1 priority at this resort. Having pioneered the whole idea of a modern, family friendly vacation, Crown Paradise Club is dedicated to satisfying the needs and enjoyment of the entire family, where everything and everyone is taken care of to the highest degree. Offering a full all-inclusive program, this resort has everything to help you experience that dream family vacation: lush tropical vegetation, activities pool, water park with pirate`s ship, a castle, nine water slides, playground area, outdoor family game area, fun programmed activities, great options for fine dining, bars and much more! The kids will have tons of fun at the Kids Paradise Club for children from 4 to 10 years of age. It features an outdoor playground area with slides, swing, and a rope bridge, and is ready for the little adventurers to have the time of their young lives. They will also enjoy arts and crafts, movie time, face painting, treasure hunts, mini-soccer, mini-bowling tournaments sand castle building contests, dancing at the mini-disco, and so many more fun activities are just part of what you will find here! Not to leave out the littlest family members, the Baby Paradise Club is for toddlers 18 months to 3 years of age and offers the perfect atmosphere to pamper your little angels. You will also find one buffet-style and three fine dining restaurants, five bars, and 24-hour room service. Activities pool, water park with pirate`s ship, a castle, nine water slides, playground area, outdoor family game area, fun programmed activities, The kids will have tons of fun at the Kids Paradise Club for children from 4 to 10 years of age. It features an outdoor playground area with slides, swing, and a rope bridge, and is ready for the little adventurers to have the time of their young lives. They will also enjoy arts and crafts, movie time, face painting, treasure hunts, mini-soccer, mini-bowling tournaments sand castle building contests, dancing at the mini-disco, and so many more fun activities are just part of what you will find here! Not to leave out the littlest family members, the Baby Paradise Club is for toddlers 18 months to 3 years of age and offers the perfect atmosphere to pamper your little angels. 20% Discount on Golf at any of the three renowned Golf Courses: Vista Nicklaus, Vista Weiskopf (host of the 2002 World Championship and 2006 PGA Championship Tour) and Marina Vallarta Joe Finger design course. Please Note: Cart rental is mandatory and is not included. Also, you will get 15% off at the course`s restaurants and on club rentals. The Club Caribe Jacuzzi and Bar is designed exclusively for the adults to relax in a gigantic Jacuzzi with bar service, so parents can also take a moment of relaxation! Entertaining is definitely a key part of your all-inclusive vacation, and at the Crown Paradise Club they have prepared a special activities program suited for every age. Try a healthy workout before starting your day at the fully-equipped gym. Compete in soccer, handball, tennis, or basketball contests with the entertainment staff! Enjoy spectacular nightly stage shows that are beautifully performed by talented entertainers. The Nitro Club features a disco and offers bar service after the nightly shows. In addition, you can take advantage of two clay tennis courts that are available for an enthusiastic game. Certain areas of the resort under remodeling. The water park will be closed from May 19 to June 8, 2019 due to maintenance.